My thoughts on the book . . .
At first I wasn’t wild about “Wild” because other backpackers dissed it for technical reasons, but I finally broke down and read the book. I loved the story. Strayed had an interesting life and was plucky enough to start a long-distance hike with no experience and little preparation. As an example of the author’s frequent lack of common sense. . . at a point mid-way on the trail, she sits on the edge of a drop off, tending to her blistered feet. One of her boots is bumped over the side, careens off the rocks, and is lost below. Her response is to throw the second boot over to join the first. One may question the author’s veracity and/or sanity. 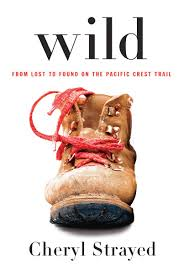 “Wild” doesn’t depict a typical hike, but it is a very entertaining read.